• There are 259 rooms and 31 suites. • La Belle Epoque restaurant and the unique restaurant for childrens La Fermette. • Conference facilities, an indoor swimming pool, a tennis court, a sauna, a fitness center, a golf course, a casino, a solarium, a hiking, a Turkish/steam bath and a bicycle rental. • Located face to the beach of the city, only 15km from Honfleur and Second World war beaches near the Mont St Michel. • 1867: Roger de Gontaut-Biron buys the villa des Flots in Deauville. 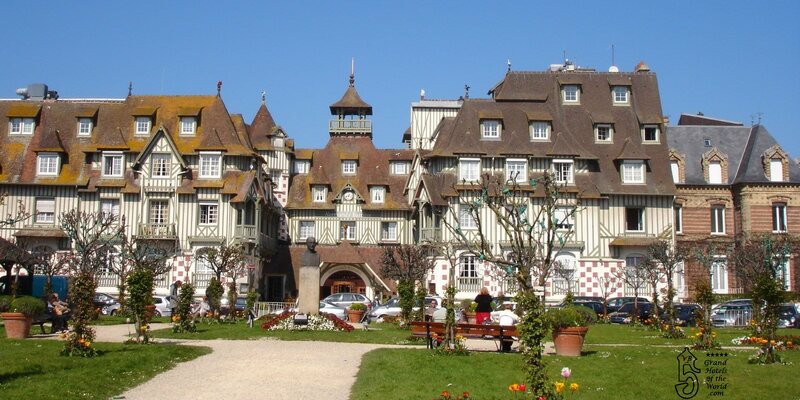 • 1909: Eugène Cornuche arrives at the Casino de Trouville, a city next to Deauville. • 1910: The major of Deauville, Désiré Le Hoc, want to develop the city and convinces Cornuche du buy the Grand Hotel du Casino – The hotel is replaced by the Casino. • 1911: Eugène Cornuché buys the villa des Flots. • 1912: Construction of the Hotel Normandy under the Hotellier Eugène Cornuché. Hotel Normandy is the first Grand Hotel of Deauville. • 1913: On the other side of the casino is built by the Hotel Royal. Eugène Cornuche is associated to Francois André who operates a casino in Ostende, Belgium. • 1913: Coco Chanel opens a store outside the Hotel Normandy. Coco Chanel and her boyfriend Boy Chapel live at the Hotel Normandy. • 1923: Creation of « la Promennade des Planches », a walkway along the beach located in front of the Hotel Normany and the Hotel Royal. • 1926: Death of Eugène Corniche. He is succeded by Francois André. • 1929: October 29, Black Thuesday the Wallstreet crash affects all the Palace Hotels of the World. • 1930s: The city of Deauville falls asleep during the Financial Crisis and the period of World War II. • 1951: Lucien Barrière, the nephew of François André arrives at the French Hotel and Casino Group. • 1962: Count Michel d’Ornano, a French Perfume Businessman living between Paris and New York becomes the major of Deauville. Barrière and Count d’Ornano decide to relaunch Deauville and bring the city back to the glamour of the past. • 1975: Creation of the American Film Festival in Deauville. • 1977: Countess Anne d’Ornano, wife of Michel d’Ornano becomes maire of Deauville and contines to add international prestige and glamour to the city. • 1990: Diane Barrière-Desseigne the daughter of Lucien Barrière becomes President of the Barriere Group. She closely connectes her Hotels to the film industry, making them a kind of annexe to Hollywood. • 2011 May 26/27: 3th G8 summit takes palce at Deauville. The US President Barack Obama and the German Chancelor Angela Merkel are among the world leaders to be in the Hotel Royal and the Hotel Normandy.